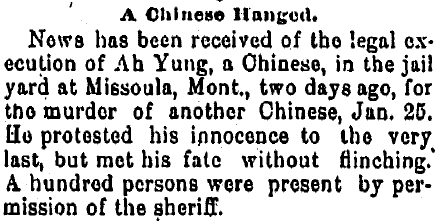 On this day in 1883, Chinese immigrant Ah Yung, aka Ah Kee, was hanged in Missoula, Montana. The quickest reported hanging, with death declared in only a minute and a half. Ah Yung was condemned for the January 29, 1883 murder of Chung Yu, the paymaster of the Wing See Company. However, the authorities believed his murder was the least of Ah’s crimes; he was suspected of killing no fewer than seventeen people, two whites and fifteen Chinese. Fortunately, the murderer remained free for only a few days and didn’t have the opportunity to commit any more crimes before he was captured again, and this time sent to jail in the newly incorporated city of Missoula. A Presbyterian minister and a Catholic priest attempted to offer pastoral counsel to the condemned man, only to discover that he was utterly ignorant of religion. Pressed to confess, Ah Yung refused and kept repeating, “Me no kill him,” — a statement he held to his dying moments. * Welcomed initially, the Chinese were an increasingly contentious presence in Montana (and elsewhere) in the 1880s. Still, there were over a hundred independent Chinese mining operations known in Montana at this time.